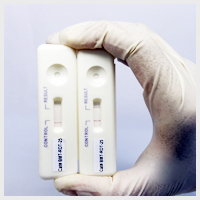 The TruStrip™ Rapid Diagnostic Test (RDT) is a smart, visual, reliable and cost-effective technology for performing on-the-spot tests to obtain a simple "yes/no" answer for the presence of biochemical substances without the need for any expensive instrumentation or specialized facilities. Individual test cards are designed to provide a simple, visual positive result that shows up as 2 lines in the test window and a single line for a negative test. When a simple "yes" or "no" answer is urgently needed, The RDT product can provide that answer within less than 5 min. There are several instances where access to lab facilities is not readily available, or a quick answer is needed to triage the situation. 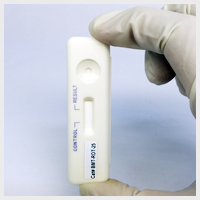 Examples include remote location sample testing, infectious disease testing, contaminated or adulterated food testing, field testing of animals, plants and other bio-organisms. The RDT product is a mobile bioassay lab on a card or strip that can be used in just about any setting to obtain that quick yes / no answer that is being sought. The RDT product delivers quick and reliable answer under pressing conditions or time constraints and allows buying precious time for more detailed analysis later. Learn more about TruStrip RDT technology and see how this product can help to maximize your efficiencies, productivity and decision-making abilities with all the flexibility of a "mobile test platform"!